That’s one noogie nobody wants. Terry shows Bruce the disk detailing a deadly virus, which Powers later shows the results of to a potential client involved in a civil war. That person is Terry’s dad’s friend. 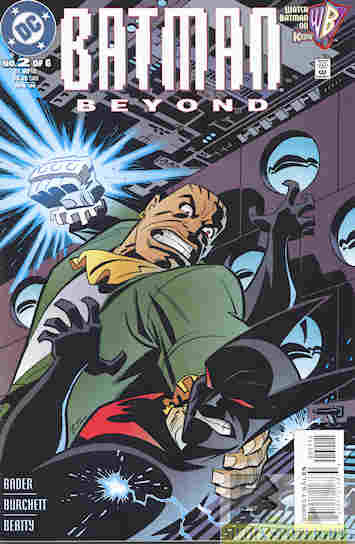 Bruce tells Terry to bring the disk to Commissioner Barbara Gordon (who took over her dad’s old job in the DCAU) but it’s taken by Powers and his muscle, Mr. Fixx. Terry then steals the high-tech Batsuit to break into Wayne-Powers to get the disk back and learns not only what the virus’ effect is, but that they’re loading it for shipping. He also learns Fixx was responsible for killing Terry’s father. Bruce calls over the cowl’s radio demanding the suit back but with this information lets Terry go after Fixx and the virus. During the fight Derek Powers is hit with his own virus, and Terry manages to sink the transport ship with Fixx inside. Bruce decides to take Terry on as his protege…as the new Batman! As for Powers, the cure is radiation or extreme heat, but the cure may be almost as bad as the virus. What they got right: As a summary of the second half of “Rebirth” (the pilot episode) it isn’t too bad. The art is good and since it comes from the series the story is also good. It’s a good introduction to the new future-time Batman. What they got wrong: Minor things really. When Terry tells Fixx he is Batman the show flashed to Bruce’s reaction and he didn’t need to say it again as he escaped the exploding transport plane. In the show, when Bruce tells Terry “welcome to my world” it was in his apartment and I liked the visual better there than Bruce and Terry shaking hands again in the Batcave. Recommendation: I highly recommend this show but if you aren’t ready to commit to the full TV series give the first two issues from this miniseries a chance. You might end up checking it out. Posted by ShadowWing Tronix on April 14, 2018 in Animation Spotlight, DC Spotlight, Television Spotlight, Yesterday's Comics and tagged Batman, Batman Beyond, Bruce Wayne, DC animated universe, DC Comics, DCAU, Derek Powers, Terry McGinnis.